OXFORD, Miss. 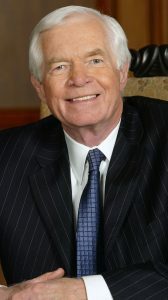 – Former U.S. Sen. Thad Cochran has left a lasting legacy on the University of Mississippi, as well as the state and nation. To honor his many contributions to the state, the UM School of Law is hosting a Nov. 11 tribute to the longtime political leader and public servant. Contributions also will support the preservation, processing and management of the Thad Cochran Collection in the Modern Political Archives, part of the University Libraries’ Department of Archives and Special Collections.